In August, IIASA leadership and researchers joined global business leaders, investors, and academics in Alpbach, Austria, to discuss the most pressing challenges of our time, including the development of pathways to sustainable change. At the Political Symposium, co-organized by IIASA, researchers, thinkers, and entrepreneurs discussed key challenges to Europe, multilateralism, peace, security, and a sustainable future. 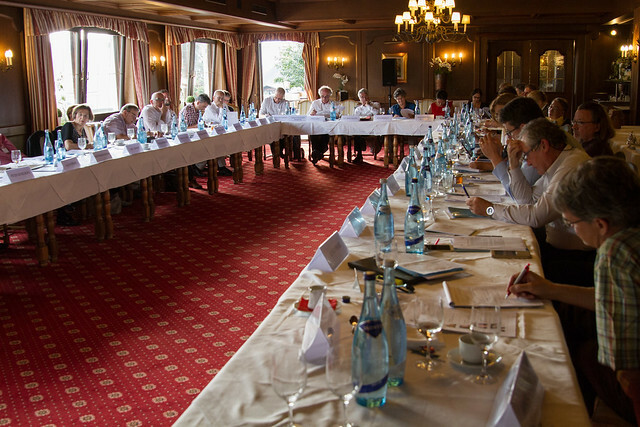 As strategic partners, IIASA and the European Forum Alpbach (EFA) launched the Alpbach-Laxenburg Group in 2013. In the past three years, this group has held high-level retreats during Political Symposia to discuss sustainable development and the implementation of the SDGs, adopted in September 2015. Global leaders from academia, business, governments, civil society, and the arts, returned to Alpbach for a fourth retreat from 27 August to 29 August. A primary focus of the retreat was examining how to enact transformative change towards enhanced sustainability and equity. Can human activities on a global scale be incentivized without unduly suppressing individual freedom? Can we use the new tools provided by the internet to empower, rather than to distract, the new generation? Can public debates withstand mounting threats of hate speech and an anti-liberal zeitgeist? How do we avoid fraud in information media, and manipulation in reputation mechanisms? The retreat coincided with the Political Symposium of the European Forum Alpbach, the Closing Plenary 'Transformative pathways to sustainability: from perception to changing behavior' 29 August focused on the necessity of utilizing multi-disciplinary approaches to develop transformative pathways to a sustainable future. The Seminar Week consisted of 18 seminars conceptualized and facilitated by internationally-renowned academics. 14:00 - 17:00, 17-22 August "Global Weirding? Climate change and population dynamics". As strategic partners, IIASA and EFA co-organized the Political Symposium, where participants from around the world discussed how united global action is required for issues such: as human security, adaptation to and mitigation of climate change, energy markets, and food security. Gerid Hager, a researcher within the Ecosystems Services and Management Program, and Piotr Magnuszewski, a researcher within the Risk and Resilience and Water Programs, participated in an experiential, science-based simulation game. Anni Reissell, Arctic Futures Initiative International Project Office Director, participated in a breakout session exploring how narratives with personal significance can be developed from scientific data detailing climate change in the Arctic. Jeff Sachs, Director of The Earth Institute at Columbia University and IIASA Distinguished Visiting Fellow took part in discussion and debate with European political, industrial, and intellectual leaders, focusing on how to transform Europe into a resource efficient, green, and decarbonized society. 9:00 – 9:05 Video introduced and featured the Alpbach Laxenburg Group. How do pioneering entrepreneurs collaborate with governments, private and civic institutions and the society to drive behavioural, social and institutional mind-set shifts needed for the SDGs to be achieved? Four entrepreneurs of the Impact Hub Network explained how they are promoting change in collaboration with established players and discussed challenges and opportunities they face. Whenever there is life, there is conflict, and there is conflict of interest. The mathematics to conflict of interest is Game Theory. In an unprecedented attempt, two scientists and four dancers collaborated to reveal insights into individual behaviour in social dilemmas. How you respond to these dilemmas will determine many of the most serious matters on Earth ? Participants included: Piotr Magnuszewski, Karl Sigmund, Senior Researcher with the Evolution and Ecology Program at IIASA, Gloria Benedikt, dancer, choreographer, and Associate for Science and Arts at IIASA, Hannah Kickert Corps de Ballet member, Vienna State Opera, Krisztian Gergye, and Domenico Miccolis Choreographer; Dancer, The Washington Ballet, Washington, D.C. Final panel under the chairmanship of Honorary Chair Dr. Heinz Fischer Former Federal President, Republic of Austria, Vienna: Transformative Pathways to Sustainable Future: Conflict and/or Cooperation? Panelists: Dr. Heinz Fischer, Professor Dr. Pavel Kabat, IIASA Director General and CEO, Milena Zic Fuchs, Faculty of Philosophy, University of Zagreb, former Minister of Science and Technology of Croatia, Hermann Hauser, Partner at Amadeus Capital Partners Ltd., Cambridge, and Gabriela Gandel Executive Director, Impact Hub Global, Vienna.